The Isla Cancun shopping mall is an excellent place to go to experience something different. 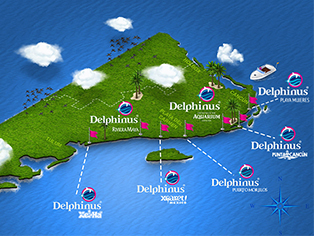 There are water canals, you can live a swimming with dolphins experience and then watch the sunset in one of the best restaurants, do you want to know more about it? Holidays in Cancun are all about living incredible new experiences, not just because of the amazing natural setting of the Mexican Caribbean, but also because of the variety of activities on offer. Located in the hotel zone in Cancun, the Isla Cancun Shopping Village has more than 162 stores, including the most prestigious and recognized brands worldwide. If that isn’t enough, there is also the Interactive Aquarium of Cancun, where you can try swimming with dolphins, imagine that? Imagine this for your family or your partner: you can begin visiting the Interactive Aquarium of Cancun and book your swimming with dolphins interaction early so that you can enjoy it without any hurry. If you are going with your partner, the Couples Interaction is perfect for you! To start off the day, shopping! If you prefer shopping before swimming with dolphins, the mall has a wide variety of the best brands where you can buy clothes, accessories, jewelry and other items than can be found only here. After having visited all the stores and been to the Aquarium, you might want to rest and grab something to eat. If that’s the case, why not try the Thai restaurant that floats in a cabin above the Nichupte Lagoon. If you like this idea, wait! Because the best of the Isla Cancun offer doesn’t end here. After a late lunch, we suggest that you admire the sunset by the lagoon and then go back to the Aquarium to see the nocturnal interaction with unique marine mammals. To end the day in the best way possible, nothing better than a nice dinner in one of the gastronomic restaurants along the lagoon shore. Do you still have your doubts about whether or not to visit Isla Cancun Shopping Village? Enjoy your next vacation in Cancun and make the most of this unique destination in the Mexican Caribbean.